The Good Dinosaur may be the oddest duck in the whole Pixar menagerie. Arriving 18 months behind schedule, and just five after the ecstatically received Inside Out, it’s at once an enormously sophisticated visual achievement—just look at the way water ripples, the way light bounces—and maybe the simplest story the Bay Area animation studio has ever told. Pixar’s 16th feature promises to transport viewers to an age when dinosaurs roamed the Earth, and yet it’s so curiously low on the big scaly attractions that the singularity of the title almost seems like a warning, if not a confession. The dinosaurs we do see, meanwhile, are strangely cartoonish, in sharp contrast to the photorealistic environments they trudge through. 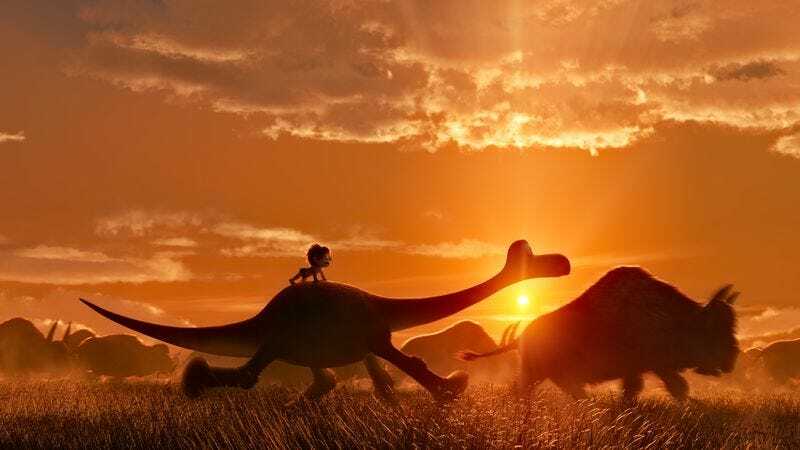 And for a film with such a plainly adolescent appeal, The Good Dinosaur also has its fair share of deranged moments, including the most surreal kiddie-flick drug trip since Dumbo. The weirdness begins with the film’s alternate-timeline premise: What if that most infamous of meteors had zipped right past the planet, creating a false alarm instead of an extinction level event? The Good Dinosaur presents a world where people and dinosaurs coexist, but also where the latter has become the dominant intelligent life-form: While humans scamper around on all fours, their language a primitive series of grunts, the dinos speak impeccable English, wield tools, and tend to crops. Evolutionarily, this doesn’t make a lot of sense. In fact, in the hierarchy of confusing Pixar universes, The Good Dinosaur lands only a couple notches below Cars and its various perplexing offspring. Our hero is a young apatosaurus named Arlo (Raymond Ochoa), runt of his litter and the underachiever of his folksy farm clan. Arlo wants to “earn his mark,” to meet the expectations of his patient Poppa (Jeffrey Wright), but he can’t seem to overcome his anxiety. Thankfully, there’s nothing like a little adventure—coupled with some parental loss, a signature of Pixar’s parent company since Bambi—to instill courage in a plucky talking animal. Swept up in a rapid river and deposited miles from his home, Arlo has a dangerous voyage ahead of him. His only steady companion: the wild child he names Spot (Jack Bright), a human offspring more feral and less adorable than, say, Boo of Monsters, Inc.
Those accustomed to the locomotive pacing of the average Pixar project might be taken aback by how poky, how decidedly un-busy, much of The Good Dinosaur is. The film jettisons many of the studio’s hallmarks (manic verbal humor, an elaborate climactic chase sequence) in favor of classically straightforward storytelling. There’s charm and beauty to the wordless stretches, those moments when the humor is chiefly physical and the striking prehistoric scenery—mountains and valleys and forests, all breathtakingly envisioned—takes precedent. Perhaps more than ever before, the animators do the heavy lifting: Every detail, from the gentle bob of a beast’s breathing to the fluid shifts of Spot’s facial expressions, has been lovingly rendered. And that’s to say nothing of the few set pieces, the most striking of which finds the fins of psychotic pterodactyls—the movie’s villainous flock—ominously dipping down out of a cluster of storm clouds, as though the sky itself was shark-infested waters. Still, most of the great Pixar movies, going back to the now 20-year-old Toy Story, are the ones whose characters are as multi-dimensional as their imagery. 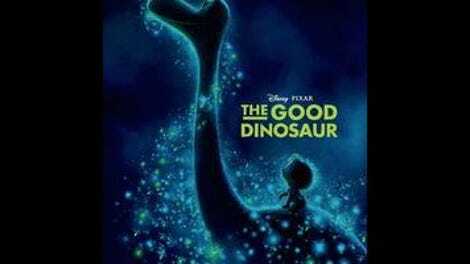 For all its visual wonder—like a swarm of fireflies, dispersed into a halo of illumination—The Good Dinosaur is awfully thin in the character-development department, its long-necked hero defined by little more than how he recoils from, then confronts, his crippling fears. (Pixar, usually unrivaled in its ability to invest family fare with profundity, has settled on a pretty rote life lesson this time.) For personality, one is forced to look to the oddly small, there-and-gone population of supporting reptiles: a triceratops who wears a security blanket of animal friends; those crazed winged adversaries, a cult in worship of bad weather and the living meals it provides; and a posse of cowboy tyrannosaurs whose outlaw lifestyle and Texas accents (yes, that’s Sam Elliott as their grizzled leader) make explicit the Western influence suggested by an especially twangy score. Will kids respond to this deliberately paced adventure, with its mixture of slapstick and fatalism? Will their parents be bored by the rudimentary narrative, enraptured by the splendid vistas, or both? The odd alchemy could be a product of tinkering: The Good Dinosaur was dramatically overhauled along the way, forcing a later release date; its original director, Up’s Bob Peterson, was replaced by fellow company man Peter Sohn, who took the project back to the drawing board. The reconfigured results can’t stand among the studio’s top tier, including the hard act they have to follow. But after a recent run of sequels and prequels from this Hollywood dream factory, the film’s unusual qualities—the way it resists the formula for success that Pixar has developed in its two decades of commercial and creative triumph—are worth celebrating. “Weird” is good. So is the movie, mostly.